Allovus employee, Amy Redmond, is deep into her “Every Letter Project,” which benefits 826 Seattle—a non-profit writing and tutoring organization dedicated to helping youth ages 6 to 18. 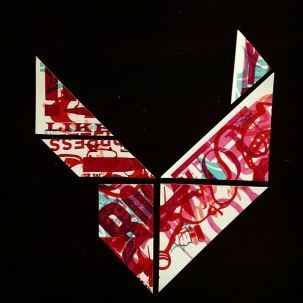 For Redmond’s project, she has been assigned the letter “V,” and is playing around with tangrams (dissection puzzles consisting of seven flat shapes, called tans, which are put together to form shapes) to create the letter. Here’s the part where you come in. Amy needs your help in choosing a design. Please scroll through the list of 34 designs and let her know which ones catch your eye. You can refer to its image by the number in its caption. To learn more about 826 Seattle, follow this link: http://826seattle.org/. Tags: Allovus, creative, design, graphic design, seattle, typography. Bookmark the permalink. My favorites are 5, 10, 17, 19, and 24. I like these best because they read really well as “Vs”. Great job! What a fun project! I’m going to pick only one. I liked several at first glance so I tried scrolling down the list a few times to see which one caught my eye first and most. By procoess of elimination…..my eye says 5. What a fun project, Amy! Your color studies are great.